Eating disorders are not one-size-fits-all. They affect people of all ages, races, gender and sexual preference. Often, this fact is overlooked in the media and entertainment industries. Netflix’s new original film To The Bone may at first seem to be perpetuating that myth—it stars Lily Collins as Ellen, after all—but in her supporting cast of characters, writer Marti Noxon reveals a bit more of the reality other depictions so often overlook. 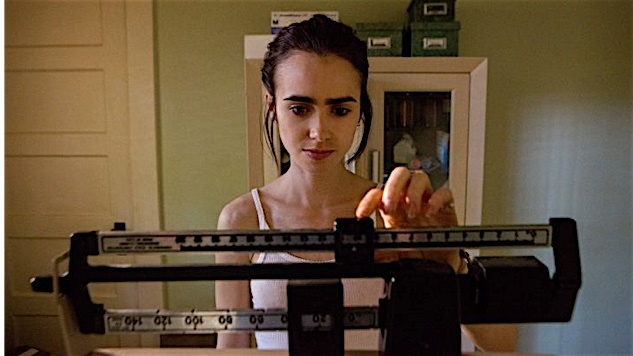 When Collins’ Ellen, who struggles with anorexia nervosa, enters the unconventional treatment center run by Dr. Beckham (Keanu Reeves), she shares a house with Megan (Leslie Bibb), a pregnant woman most likely in her late 30s (Bibb is 43); Luke (Alex Sharp), a young male dancer; Kendra, an African-American lesbian; and three young, white women who are in their late teens to early 20s. This treatment facility is not unique. Megan is part of a growing demographic of women who struggle with an eating disorder later in life. While her age is not specifically mentioned in the movie, her appearance and maturity makes it apparent that she is older than her housemates. Kerry Neville, a writer and professor at Georgia College and State University, first entered treatment for anorexia nervosa at 38 years old, and went into remission after treatment at the age of 40. Neville was surprised to see other women her age or older, along with men, people of color and more. This provided motivation and encouragement that she was not alone. While two years may seem like a long time to struggle with an eating disorder, for men, they go largely undiagnosed for many reasons, including that it’s viewed as a women’s disease. The character of Kendra captures two other categories not often spoken about or depicted in film by being an African-American lesbian woman. Although she serves as a minor character in the movie, her appearance as the only patient of color is important. Writer Dani Janae, an African-American woman who suffered from both anorexia nervosa and bulimia, explains that in communities like hers, eating disorders often go undiagnosed for years as it’s not a part of their culture. By showing that eating disorders are not exclusively for one specific age and gender, Noxon touches upon a social issue that is rarely discussed in the general public. And it does a disservice to those who suffer in silence. Gia Miller is a health and wellness writer based in Katonah, NY. This may or may not have been the first adult movie she’s watched in a year.